Vella Cheedai is a traditional South Indian sweet – It is rock hard on the outside and surprisingly powdery inside. As kids we used to compete for ‘The strongest teeth’ and the winner was the person who managed to bite into the crust. For the weak minded – better break it with a metal pestle or a rolling pin before digging your teeth – this one is tough! It is one of the easiest sweets, and yet I seem to make it only once a year on ‘Janmashtami’. If making for the first time try in small quantities – they behave a little tricky and the sweets burst in the frying pan if not formed properly. Every festival in India is characterised by specific sweets and savouries. 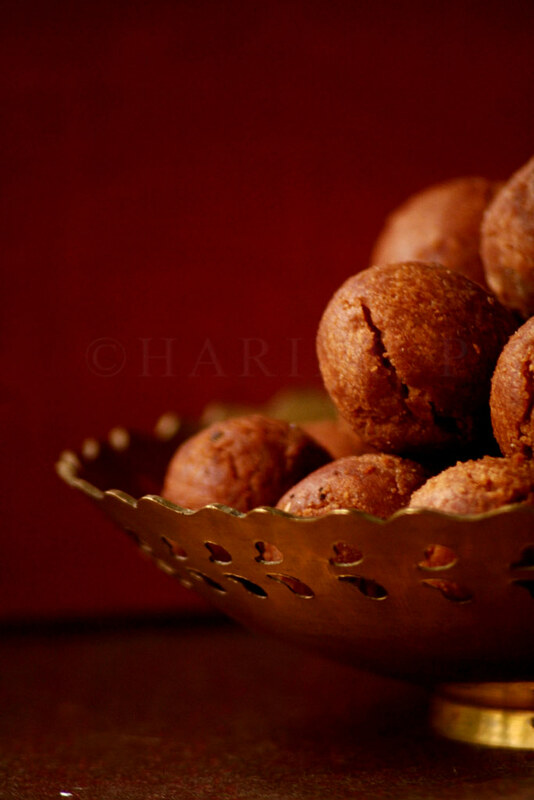 Tamilians make several goodies during Janmashtami and vella cheedai is a must. Long back I bought a book titled ‘Southern Delights – Recipes to Remember from Palakkad’ by Parwathy Akhileswaran. It contains all the recipes specific only to Palakkad. It’s a great book if you would like to learn more about the different types of molagootals, morkootans, the naivedyams etc. I have tried many sweets from this book apart from the one I am sharing here. Note – Over time I have made some minor changes to the original recipe. 1/2 to 3/4 cup organic jaggery, powdered. This quantity depends on the sweetness of the jaggery. Use one with minimum salt concentration. Place the jaggery in a heavy wok and add a ladle of water to it. Strain once to remove any impurities and heat again in the wok till it comes to soft ball consistency. Keep checking as detailed below. Take a cup of tap water. When you drop a little of the syrup in the water and roll, the jaggery should form a soft ball immediately. If it melts, it means that the syrup has to be cooked a little more. If it solidifies immediately, the syrup has cooked beyond the stage. Add sesame seeds or coconut pieces and oil. Remove from fire and add the rice flour mixing to form a thick dough. Let it cool slightly. While it is still warm, knead well with greased hands, otherwise you are bound to feel the heat. Optionally you could use sterile gloves while forming the balls. Form one inch spheres without any cracks and set aside in a plate covered with cloth. Heat the oil and fry a few balls at a time, swirling them around with a slotted spoon so that they are evenly fried. When they turn golden brown remove, and drain onto a tissue. At this stage do not press them as they will be soft. As they cool they will harden. Similarly fry the rest and store in sterilised air tight containers when completely cool. These last really long, but then they are so tasty – they don’t last in my house for more than a day. If your syrup has crossed the stage of soft ball consistency add a little warm water, other wise the balls crack and splutter when fried. If you find that the dough is too hard or not soft enough to form a ball heat a little water, and add a teaspoon at a time while kneading. The dough should be softer than matthri dough but slightly harder than dough for poori. I have seen that frying many balls at a time prevents cracking. I have always been intimidated by the soft ball consistency, as also by the one/ two string sugar syrup consistency. I came thru FB, where u have a pic of baked Vella cheedai, will u post about it later?I’d like to try that version. The first picture is stunning ( of course!). Sometimes vella cheedai can come apart in the oil while they fry. This means that there’s too much jaggery, so add a little rice flour to the dough and knead well before frying the rest. So it is a good idea to fry just one in the beginning to see how it turns out before proceeding with the rest. Jayashree – I have done that too but I felt the cheedai crust becomes a little softer than I like, but the insides taste equally good! Thanks for the tip – I have included it in the update section. Visited your blog after a long time – we got our net connection in place at last!! Anjali – what you say is right but I would probably add more coriander as the flavor of mint becomes really strong then! Nags – Thanks, I am editing and sending it pronto! Bharti – I rediscovered the tastes of gud a couple of months ago when I went vegan!! Mmm..that looks so tasty. Now days I try to use gur in all the desi desserts. The earthy flavor is just wonderful. My kidz would just love your gur balls. The cheedais look perfect. And guess what??? They are now available in shops here in Chennai during the festive season. So is nonbu adai, uppu cheedai and a dozen other things. I don’t wait until the jaggery reaches soft ball consistency. I just boil it in water until completely dissolved and then stir in the flour and mix until it forms a smooth dough. That gives good results too. Vij – Thanks for visiting! I agree cheedais are a little tough until you get hold of the correct syrup consistency which I luckily arrived at soon! Dershana – I gave the spicy cheedais a miss this year. Yes, this one tastes good and is going to Mythreyee soon! Madhuram – I guess that’s perfect coincidence ha ha:) Looking forward to your recipe for green! Believe me or not for the past 2 days I have been thinking of you and how I missed the “Red” event and I’m thinking of something radical for “green”. Wish you had posted the vella cheedai recipe earlier. My mom tried it this time for Krishna Jayanthi and it did not come out well. Usually my grandmother prepares the bakshanama, so my mother did not get a chance to prepare it and this time it messed up. Will keep this as reference for the next time. and yes, since you’ve missed purva’s event, send these to Maithreyee’s sweet series. this time it is fried/steamed sweets. hi dear, mmm, i’ve always had the spicy cheedai, never heard of cheedai with vellam. must be nice. the pics look gorgeous. cheedai looks perfect!! i guess its quite a difficult snack to make..hats off to u for that!! my mom always ends up making it hard…. Perfect cheedais. I haven’t tried it even once. Am planning to make then soon. Send it to Mythrayee. for the sweet series, who is celebratinf fried sweets this month.